Welcome to S.A.M.Y.’s Alpaca Farm and Fibre Studio. We are a family business located north of Strathroy. 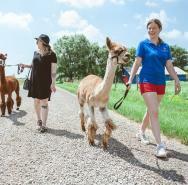 On any Saturday or Sunday, you can come visit our alpacas in the pasture, hand feed them, and get acquainted. We can also take some of them on a leash for a walk down the country lane. In the months of June, July, and August you can come visit any day of the week! We are very flexible and are more than happy to customize the visits to our guest's wishes. In the past, we've had extensive picnics where the alpacas come and visit, a surprise marriage proposal, and photo shoots for Christmas cards.